DISCLOSURE: This is a sponsored post in conjunction with USFamilyGuide.com. I will receive free admission for a future visit in exchange for a review. No further compensation was provided. All opinions are my own. This past Fall, my family and I had the chance to visit the Ripley's Believe It Or Not in Baltimore, MD. It was our first time visiting a Ripley's Museum and we all had a great time! (See my previous post about our last trip.) We've been wanting to go back, especially because my oldest daughter had missed it the first time. She had a field trip with her History Club at school and had to go to that instead. Starting this Friday, June 19, a new display will be coming to the Ripley's Believe It Or Not. 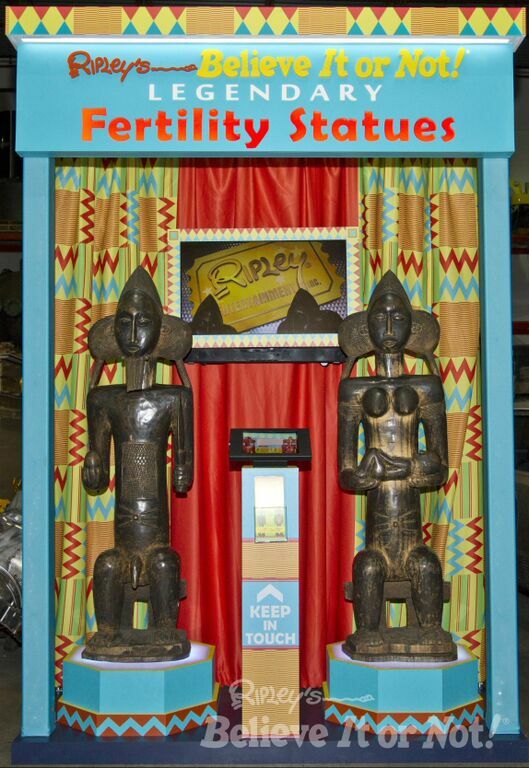 The Legendary Fertility Statues will be on display in the lobby. It is believed that if you touch the statues, you will be able to become pregnant! The statues were hand-carved by the Baule, who live in Cote d'Ivoire (Ivory Coast) in West Africa, and probably date back to the 1930s. Ripley's acquired them in 1993 and put them in the lobby of the company headquarters in Orlando. Within months, 13 women, including staffers and office visitors, were pregnant. While I don't need to get pregnant (four kids are enough for me! ), it will be cool to actually see these Fertility Statues! Maybe I'll bring along my sister. My Mom has been begging her for a grandchild! Ha! Use this coupon and when you buy two attractions at Ripley's Believe It Or Not in Baltimore, you can get a third attraction free! Offer expires 12/31/2015. I know, right?! I don't need to have more kids! That would be cool if it was that simple to get pregnant. These would be fun to see.